You can use it as remote switch, anti theft beacon, counter, movement detector and so on. First, I would like to thank Amazon for announcing AWS IoT, a great environment for Internet of Things. After three weeks experiment I have successfully implemented my project with AWS IoT. Actually, I am thinking to make a Motion control IoT button which can be used to detect movement or thief from remote place and I was inspired by Amazon IoT button. Finally, I made it by Raspberry Pi and Amazon AWS IoT. I used PIR sensor for detecting the movement. Raspberry Pi is used here as a gateway which transmit a message to AWS using MQTT protocol. AWS IoT is working as a MQTT broker. Another Raspberry Pi is used as MQTT subscriber. When publisher publish message to a specific topic after detecting any movement MQTT broker( AWS IoT) transmit it to subscriber. According to received message subscriber (Raspberry Pi) implement predefined action. Action may be an alert or switching any light or camera etc. System also sends notification email or sms to your email address or phone number using Amazon SNS service. Before going to the main task I want to give a brief introduction about mqtt protocol and PIR sensor. MQTT protocol uses a publish/subscribe architecture in contrast to HTTP with its request/response paradigm. Publish/Subscribe is event-driven and enables messages to be pushed to clients. The central communication point is the MQTT broker, it is in charge of dispatching all messages between the senders and the rightful receivers. Each client that publishes a message to the broker, includes a topic into the message. The topic is the routing information for the broker. Each client that wants to receive messages subscribes to a certain topic and the broker delivers all messages with the matching topic to the client. Therefore the clients don’t have to know each other, they only communicate over the topic. This architecture enables highly scalable solutions without dependencies between the data producers and the data consumers. PIR Sensor: PIR-based motion detector (PID) or a passive infrared sensor (PIR sensor) is an electronic sensor that measures infrared (IR) light radiating from objects in its field of view. They are most often used in PIR-based motion detectors. When a warm body like a human or animal passes by, it first intercepts one half of the PIR sensor, which causes a positive differential change between the two halves. When the warm body leaves the sensing area, the reverse happens, whereby the sensor generates a negative differential change. These change pulses are what is detected. f. To activate already created certificate, select particular certificate and then Activate it from the Actions menu (Fig-8). g. Now, you need to attach the thing to the certificate. To do it select the certificate and then Attach a thing from the Actions menu (Fig-9). h. You can see details of thing on the right side as in screenshot by clicking on the thing name. AWS IoT is now ready for our project. Now, it is the time to connect Raspberry Pi to AWS IoT. i. Create a directory to /home/pi of Raspberry Pi & named as aws-iot. ii. Rename private key & certificate as private-key.pem & cert.pem respectively. iii. Copy the files to aws-iot directory. You can use Filezila. iv. Download the root CA certificate from the link and save it as rootCA.pem. Copy it to aws-iot directory. vi. 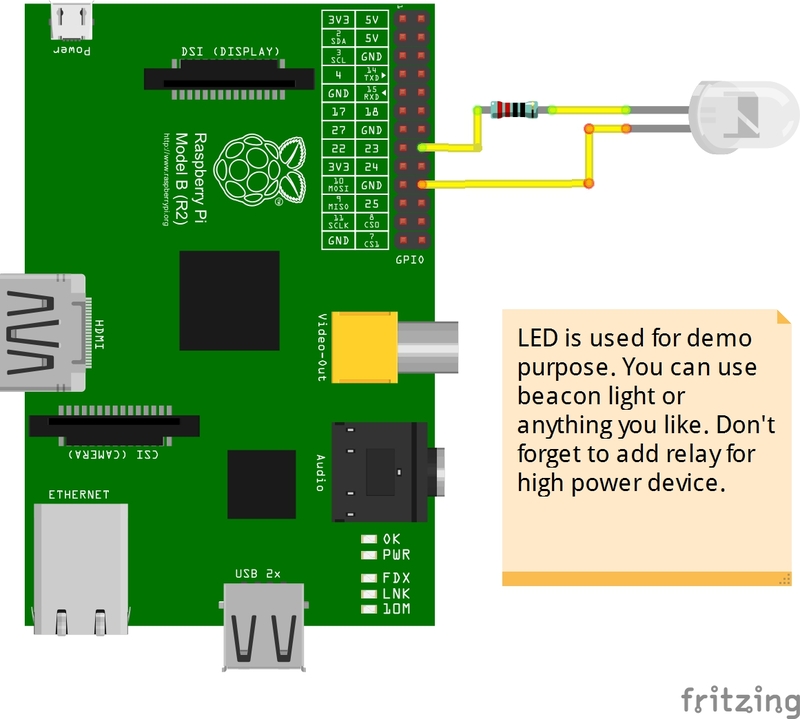 Upload or copy it to aws-iot directory of raspberry pi. If everything works well then you should be able to see the status of device on IoT console. That's it! Your Raspberry pi is connected to AWS IoT. Set up your another pi as message receiver, which will receive the published message by the sensor-client. You can get API endpoint from details of your thing. Congratulation! Your project is ready to experiment. Move your hand above the PIR sensor and observe your subscriber. If you want to keep track of movement you can use DynamoDB. To setup AWS SNS you can follow my another tutorial (AWS Emergency Notifier) where complete instruction about AWS SNS setup was illustrated with details image. Data is saved as json format. This code is for MQTT publisher. aws-iot sdk is used for the development of this Node.js code. When any movement is detected it publish 1 to the topic(topic/test). This Python code is for subscriber, when movement detected it receive 1 from the broker and makes a gpio pin high. Paho mqtt is used for developing the program.